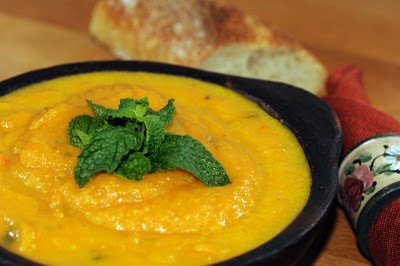 For infants and/or picky eaters, you can serve them just a carrots puree;for kids who eat soup, you serve them the carrots soup; and for grown-ups, you serve the soup with fresh mint on top. The difference between the puree and the soup (in this case) is just the amount of liquid you'll pour in. Bon Appétit! Scoop the vegetables out and reserve the cooking water. Serve with fresh mint, crème fraîche and toasted bread. If my children are only eating soup for dinner, I add couscous to the soup. If you cook the mint with the vegetables, you won't feel the taste. If your children are not picky about eating "green pieces" in their soup, then you could try adding some. That's what I did with my children and they did not pick the mint. I use a pressure cooker to make this soup and it cooks in less than 10 minutes.